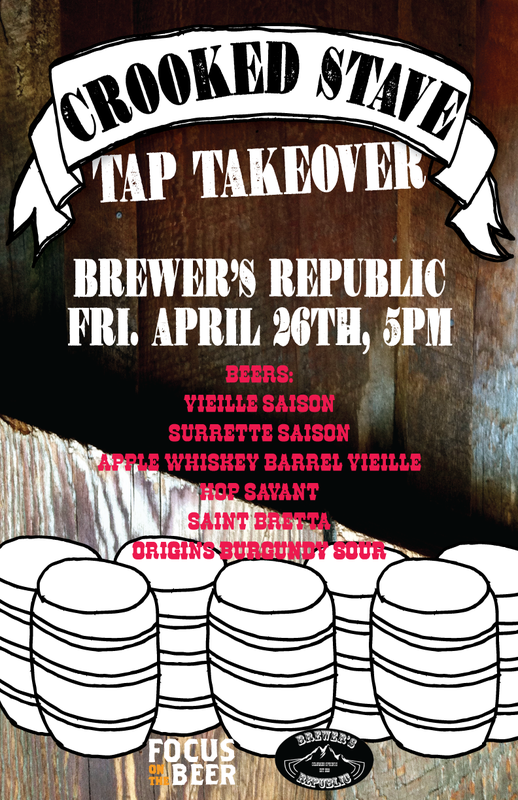 Brewer’s Republic has teamed up with Focus on the Beer to bring you another lovely Tap Takeover. This one comes from our wild wild friends up in Denver, Crooked Stave Artisan Beer Project. Crooked Stave specializes in beers with wild yeast strains and barrel aging. We’ll have six beers on tap, two of them are from Crooked Stave’s currently-most-popular line and the other four are specialty one-off beers that you won’t want to miss! We will also have Kyle Krebsbach, the Crooked Stave representative to answer all your questions about wild yeast, Brettanomyces, barrel aging, the brewery’s plans and more. Origins Burgundy Sour – A blend of two beers aged in French Oak barrels from 1.5-2 years. An homage to the history of barrel aging.